The drum is not just a musical instrument. 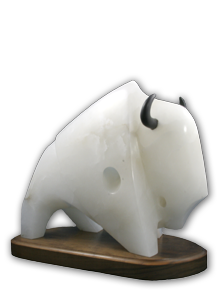 To the Lakota, Dakota and Nakota people, it holds great cultural and symbolic power. They believe the drum has a life of its own, as well as its own powerful spirit. The drum is the heartbeat of the Indian Nation. It carries the heartbeat of Mother Earth and calls the spirits and nations together. A Native drum group performs at St. Joseph's Indian School's Annual Powwow in Chamberlain, South Dakota. Native Americans believe the drum often helps bring the physical and mental side of a person back in touch with his or her spiritual side. Just like many things in the Native American culture, the drum is used to bring balance and renewal to a person through participation in dancing, singing or listening to the heartbeat. The drum is referred to as both the instrument and the group of people gathered around it to play and sing. It is central to all powwow ceremonies. It makes the dancers want to move. The better the drum, the easier it is for the dancers to get excited about their performance. American Indian drums are constructed of a wooden frame, or a carved and hollowed-out log, with deer, elk, horse or buffalo hides stretched taut across the opening by sinew thongs. Traditionally, Native American drums are two to three feet in diameter. The drum is considered sacred and is to be treated with great respect by anyone who comes in contact with it. Each drum has a keeper to ensure no one approaches it under the influence of alcohol or drugs. Nothing is ever set on a drum, nor does anyone reach across it. Many drum groups bless and name their drums in special ceremonies before sounding them at a powwow. Gifts are often designated to the drum, and many have their own ceremonial medicine pipes. Some drums even have their own song, which is sung as a warm-up at the beginning of the powwow. Each powwow usually has a host drum and several guest drums. The host drum is usually made up of a group of eight to 11 men. Traditionally, men are the drummers, but women often take part by singing with the drummers. There is a variety of rhythms and drumbeats, and each type of song requires a different one. The drumbeats must be in perfect time, and each singer must be in perfect unison. The drum group is responsible for being able to play whatever kind of song is requested at the powwow.